Frank Gehry's Vontz Center signature. Serving as a gateway to the University of Cincinnati’s medical campus, this building has the curved massing that is the signature of its architect, Frank Gehry. 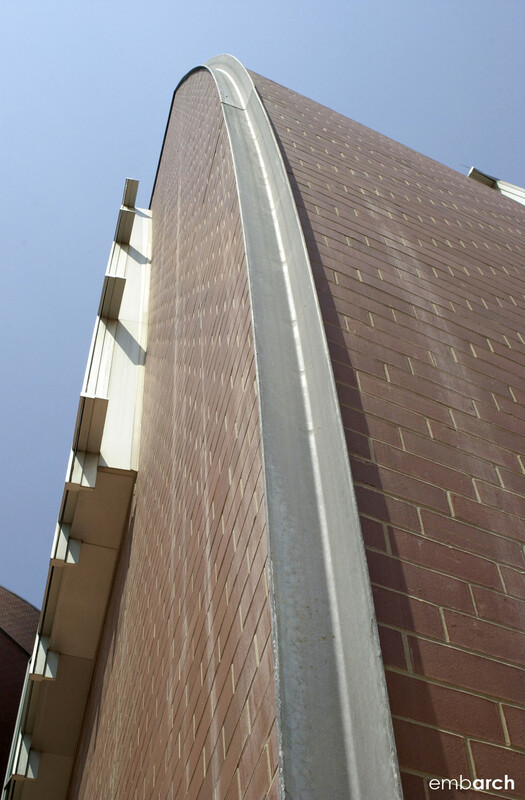 Gehry’s typical reflective metal cladding was exchanged for a more budget-conscious brick, yet the traditional scale of brick creates an interesting counterpoint to the building’s exaggerated volumes. Windows stand apart from the rest of the building envelope, occupying their own planes and articulated with aluminum grids. The gridded glass even extends beyond the edges of exposed window frames, adding a delicate emphasis to the windows as standalone objects.